Microsoft has been left 'overwhelmed' by the pre-sales figures of its forthcoming Windows 7 according to UK Marketing Lead Leila Martine. Martine, responding to the reports that the likes of DSGi and Amazon had been shocked by the sheer levels of demand for the product, told TechRadar that making the Beta version widely available had been a huge factor. "It's been incredible," said Martine, when asked about the sales. "It's been an overwhelming response and very rewarding. "Feedback has been the most important part of the Windows 7 process – it's made it what it is today. At one point we were getting terabytes of data from customers. "It's been a very strategic decision to open it up and get feedback – it was also important to act on that feedback. It's been the right decision." 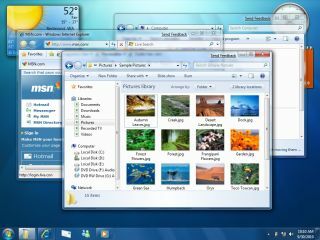 Martine admitted that lessons had been learned from what was an underwhelming launch for Windows Vista, with the availability of drivers and support from third parties of paramount importance. "One thing about Vista was that was that, in planning a far more secure OS, it requires so much of the ecosystem to change how they were creating their software," explained Martine. "So I think that a lot of that work has been done now. We've made a lot of that happen but we still have 10,000 partners in our partnership readiness program – people like Nvidia for instance - and the majority of our hardware partners have said that they absolutely will have hardware support and drivers ready."